Home Sports Men's Basketball Sunflower Showdown: A competitive rivalry or passionate rivalry? The word, though, has many different connotations that come with it: friction, disdain, hatred and enmity to name a few. Those words could just as easily be used to describe the relationship of between K-State and Kansas. But can the Sunflower Showdown honestly be called a rivalry on the field? 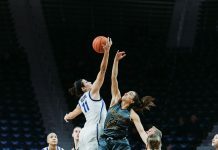 Whether you are talking about football or basketball, one team has pulled away in recent memory and made themselves the favorite every season. In football, K-State is the favorite by far. 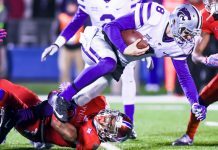 Besides the questionable Ron Prince era where the Wildcats dropped three-straight games, K-State has dominated the series in recent memory, holding 20-9-1 record over the last 30 years. But what the Wildcats hold on the football field comes nowhere near the Jayhawks’ dominance on the hardwood. Kansas holds a 21-4 record in the last 10 years on the court, a 50-4 record in the last 20 years, and a 76-24 record in the last 100 games. Kansas’ performance is dominance at its finest. The Jayhawks are undoubtably the big brother of the Sunflower Showdown in basketball. So, can this series be called a rivalry? Can the Wildcats’ .240 winning percentage in the last 100 games be considered competitive? 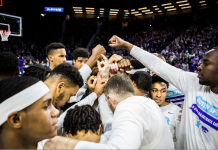 More so, should the Sunflower Showdown rank among the most competitive rivalries in college sports, such as Duke and North Carolina? The answer: no. At least not on the field. K-State and Kansas is nowhere near Duke and North Carolina in terms of competitiveness. In that series on the hardwood, North Carolina leads Duke 53-47 in last 100 games. That series is competitive. It could go either way every game, and rarely is there a definitive favorite. That series is a rivalry at its finest. As a historical disclaimer, the Sunflower Showdown series was competitive at one time, with both programs being able to win on any given night in both football and basketball. 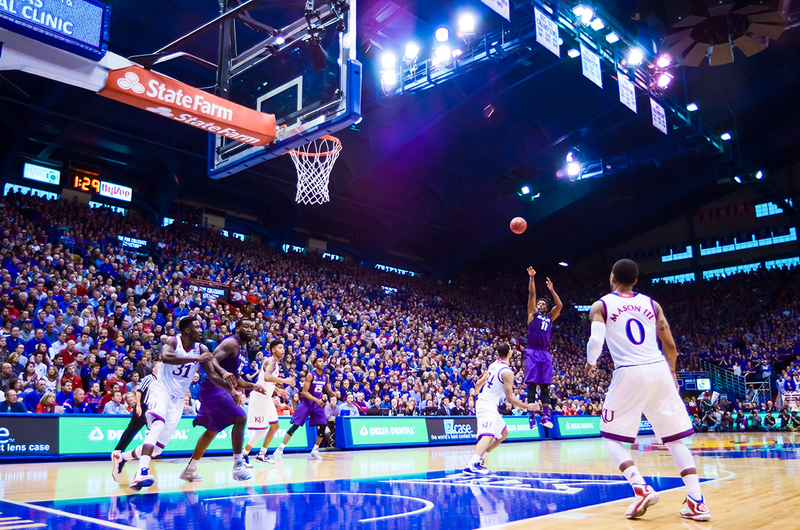 However, K-State has grasped firm hold of the series in football while Kansas has dominated basketball. Let’s think about it in another way. Can you call a game a competitive rivalry when a victory makes a season worth it? When K-State pulls of a victory on the hardwood, that is the highlight of the season: the winning shot, the ecstatic faces of the athletes, the fans storming the court. Just take a gander at this season’s basketball intro video. Similarly, when Kansas upsets K-State football, goalposts are victims that end up in a lake. When a series is dominated so heavily by one side that a victory means so much to a fan base and a team, it isn’t competitive. Let’s stop for a second and contemplate whether a rivalry should be defined by the competitiveness of the series or, alternatively, whether a rivalry should be classified by the passion between fan bases of the series. If that’s the case, the Sunflower Showdown should actually be considered a pretty big rivalry. Both fan bases are passionate about their schools’ athletics; secondly, and most importantly, they are passionate about disliking the other school. The fan bases truly despise each other. The fire burns deep in the hearts of each schools’ students, deep enough to have tall tales of why the fans don’t like each other. When fan bases and schools have historical justification about why they don’t like each another off of the playing field, justification that dates back to the formation of the two schools, there is definitely a clear rivalry present. Now, whether the disdain for one another is justified or not, the passion between the two athletic programs and their followers is what makes it a good series. The argument of whether this is truly a rivalry boils down to one thing: can the passion of the fan bases outweigh the truly uncompetitive series?